Three cheers for Lesley McAllister! In a recent article, this empirically-minded law professor explains why so many cap-and-trade programs have not made any dent in the emissions they were meant to control (34 Colum. J. Envtl. L. 395, 2009). Ever since I read this article a few weeks ago, I have been pondering its implications for the upcoming negotiations in Copenhagen. I’d like to highlight just a few of the lessons Professor McAllister gleans from a careful study of four existing cap-and-trade programs in the U.S. and Europe, and I hope she will forgive me for oversimplifying and injecting my own views with abandon. Unlike most analyses of cap-and-trade programs, which focus on the details of the trading regime, Professor McAllister focuses on the setting of the cap. The conventional wisdom is that the cap is set first, based on the level of emissions reduction needed to protect the environment, and then the emissions “pie” is divided up and allowances are allocated to industry on some equitable basis. As it turns out, this is not the way it works at all. In reality, industry first determines what allowances they need to operate as usual, then they inflate these numbers a great deal and submit them to the cap-setters. Then, an overall cap is set based on a percentage reduction from the aggregate industry-derived amount. Because of the inflated initial estimates, this percentage often does not even bring the cap back down to the actual business-as-usual level. On top of this, the cap-setters tack on numerous loopholes, off-ramps, giveaways, and exceptions, often raising the cap to a level much higher than business as usual. The result — overallocation! In other words, the purported “regulators” are consistently setting caps at levels that allow industry as a whole to pollute MORE than they did before. And, this problem persists throughout the life of the cap-and-trade programs, not just in the early years. Despite the glaring failure of cap-and-trade proponents to prove that it is actually a legitimate means of reducing emissions, the negotiators on their way to Copenhagen are moving full steam ahead with cap-and-trade as though its effectiveness is beyond dispute. Another common misconception derives from the use of the term “efficient” with respect to cap-and-trade. Proponents of cap-and-trade will tell you it is a much more efficient (i.e., cost-effective) way of getting from point A to point Z than conventional regulation. As the empirical evidence shows, however, cap-and-trade as it is currently practiced never gets us anywhere near point Z. Not surprisingly, it is fairly cheap for industry to get from point A to point B (and I’m being generous by assuming that cap-and-trade even gets us that far). Paying less for doing little or nothing, however, is not the same thing as paying less while achieving the same thing or better, which is the definition of efficiency. If our goal is to move much farther down the alphabet with respect to climate change, we may want to abandon cap-and-trade entirely and embrace the tried and true principles of conventional regulation. Or, if we are so committed to cap-and-trade that we cannot shift gears now, we must dramatically overhaul the way caps are set and adjusted over time. Most importantly, caps for greenhouse gas emissions should be set based on what nature and science demand, with reasonable consideration given to technological and economic constraints. In contrast, policymakers must not let industry grab the reins and drive the setting of caps to the point that they become meaningless. This entry was posted in Cap and Trade, In Our Own Words and tagged allowances, Cap and Trade, conventional regulation, efficiency, inflated estimates, loopholes, overallocation. Bookmark the permalink. A carbon tax and cap and trade program are equivalent under a set of standard assumptions. Either instrument will efficiently provide the sought after reductions in emissions, i.e. the people who can most cheaply reduce emissions will do so. However, as we have seen, and you note in your post, there are more political maneuvers available with a cap and trade program. A carbon tax, while politically less palatable, is a much simpler system to implement and provides far more transparency than a cap and trade program. My second point regards your warning “that policymakers must not let industry grab the reins and drive the setting of caps to the point that they become meaningless.” The caps are only meaningless when the price of a permit is zero. Whenever the price of a permit is positive, a reduction in emissions is occurring. This might not be the right cap, as you argue, but the cap and trade program is achieving its stated goal. 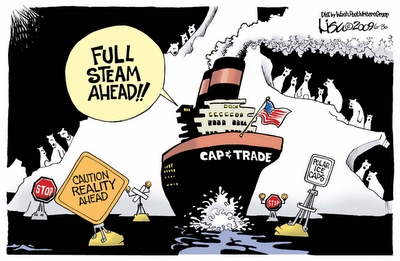 If the cap and trade path is irreversible, then the level of the cap is very important. Thank you for joining the conversation on our blog! I generally agree with your first point with regard to carbon taxation. As to the second point, however, it is a common misconception that any price above zero for allowances will drive down emissions. I would encourage you to read the McAllister article I cited because it explains very well (with a lot of supporting empirical data) why the price of allowances must be equal to or greater than the marginal cost to a facility of installing pollution controls in order to start driving down emissions at all. Prices in the $20-$50 range are roughly equivalent to just the transaction cost of purchasing the allowance, and this usually means the facility is speculating that control costs will be higher in the future and wants to bank some allowances just in case. Prices in the $2,000 range or above would more likely be the point at which we could expect actual emissions reductions. (I’m using EPA’s benchmark for the cost per ton of “highly cost effective” pollution controls for traditional pollutants since the cost per ton of GHG reductions is less well established.) Unfortunately, however, allowance prices have rarely been this high on a consistent basis in any of the trading programs included in the study. Along with high enough prices, consistency is extremely important in driving emission controls because of the need for facilities to have some certainty before making large capital investments. Indeed, another big problem with trading is that the volatility of prices eliminates the kind of certainty necessaary for encouraging such investments. Happy to hear any other thoughts you might have on these issues.